Should Kids Get Pocket Money? So, you’re debating whether letting your kid have an allowance will inspire them to save — or spoil them. But did you know that giving kids pocket money teaches them about financial responsibility and builds their confidence? Giving kids an allowance ensures that from a very young age they start to attach value to money. They realize that money has a purpose. And they’re inspired to learn more about it the more they see it and use it — and maybe try to eat it if they’re a toddler (don’t let them, duh). Of course, there are a few different methods for giving kids pocket money. You may or may not want to use it as an incentive for your kids’ chores, for example. Some parents prefer letting kids earn money for household help such as doing the dishes or making their beds as an early intro to the adulthood concept of paid employment. Other parents believe chores should be unpaid because in real life (i.e., adulthood) you don’t get monetary compensation for simply cleaning up after yourself. Whatever your preferred approach, is it really necessary to shell out a few dollar bills every week or month just to introduce your kid to the whole moneymaking idea? Yes. Yes it is. We’re not talking about anything ridiculous here; keep allowances age-appropriate and reasonable. 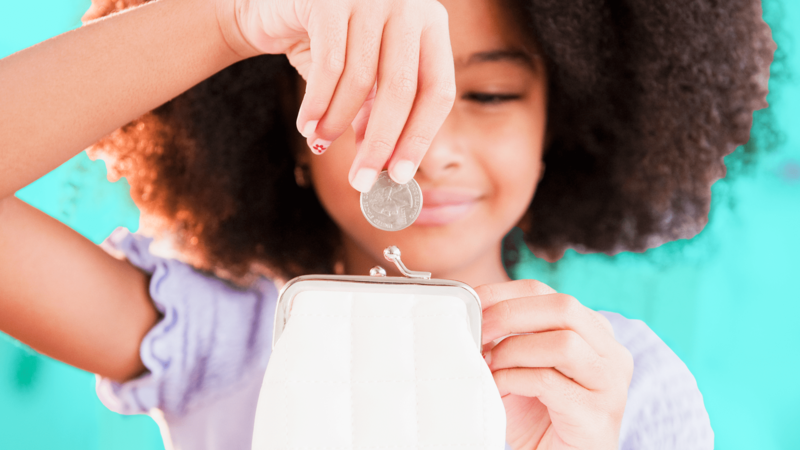 But in case you were thinking about skipping the whole pocket money thing with your kids, here are three key reasons to give that allowance after all. Money can’t buy you love, but it sure does help when it comes to food and housing. Giving a child their own pocket cash allows them to learn early on the value of money. And it doesn’t have to be transactional (e.g., they get a dollar per chore completed); it can simply be a weekly or monthly allowance regardless of whether they have done any extra chores. How much should you give them? Time‘s Farnoosh Torabi writes that “experts recommend giving $1 a week for each year of age, so a 10-year-old would get $10.” And if you do choose to give your child a payment per chore, think about splitting up the amount so that it equals $1 a week for each year of age. Just make sure you stick to a sensible amount, since giving kids too much money can be more harmful than beneficial. An allowance also allows kids to be independent. It gives them an understanding that their actions (saving) can have favorable consequences (being able to afford a much-anticipated purchase). They will learn valuable lessons about saving, spending and working toward a goal — namely that if they want a big-ticket item, they are going to have to work for it, save their money and be creative. That might mean finding odd jobs to do to earn more than they would in a usual week. Learning about delayed gratification is huge for kids and will help them immensely as they get older. Plus, data released from the Financial Industry Regulatory Investor Education Foundation, which seeks to promote financial literacy, revealed that high school students who are required to take personal finance courses have better average credit scores and lower debt delinquency rates as young adults. And you can lead by example when it comes to modeling that skill. Beth Kobliner, author of the New York Times best-seller Get a Financial Life, writes, “The sooner parents start taking advantage of everyday teachable money moments (for example, give a six-year-old $2 and let her choose which fruit to buy), the better off our kids will be. Parents are the number-one influence on their children’s financial behaviors, so it’s up to us to raise a generation of mindful consumers, investors, savers, and givers.” So, why not involve your children in the monetary exchanges of daily outings at the grocery store, bank, etc.? For older children, have them count out the change and do the math themselves. The benefits of giving your children pocket money are substantial. And after all, “it’s up to the parents to make sure our children have a financial education before going out to the real world, where they will make financial decisions that will affect the rest of their lives,” Certified Financial Planner Liz Frazier Peck told Forbes. Teaching responsible money management will not only allow your child to make financial mistakes before they really matter; it will also ensure your kids and their cold, hard cash are better prepared for the cold, hard realities of adulthood. And isn’t that what every parent wants?